Yacht racing scene portraying the dramatic finish of the 1885 America's Cup Race off Sandy Hook, as spectators on a ferry boat cheer. 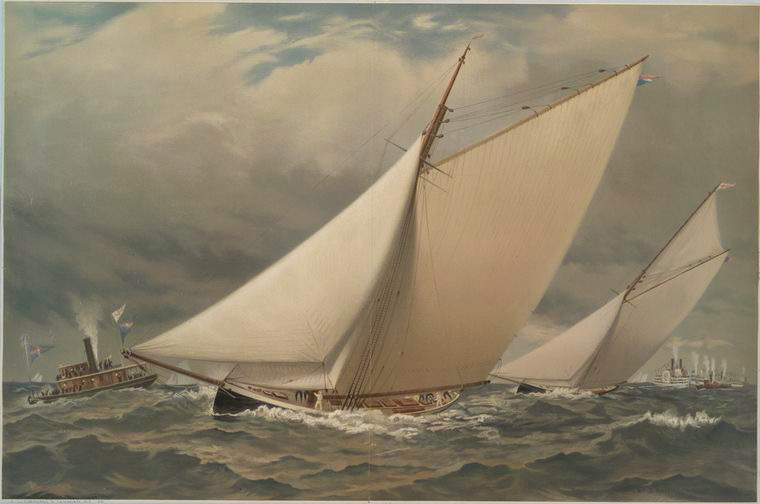 The print may have been intended to appeal to hometown as well as national pride -- produced by a Boston publisher from a painting by a Boston artist to commemorate the triumph of a yacht designed in Boston. This print was part of an important series of chromolithographs published by Prang in the 1880s called Pictures of American Sport, after painting by well-known artists of important yacht races.